Another week has come and gone. For most of us, it has been a full one. I have finished the week with our students from the Newman Association at Allegheny College and participated in our Provincial Chapter, as well as drove back to Philly avoiding all the snow storms. God is Good! Last week, we reflected on some of the thoughts from the Allegheny College students but I couldn’t help but think of them when I heard the first reading this weekend, the call of Samuel. Like Samuel, the students heard the call to respond to God and, in their case, it was through service, sharing and simple laughter. The call to this week of service had its different stages of involvement. Like Samuel, they were being called, but by whom? They questioned and then finally agreed to give up their last week of vacation to answer God’s call. As all of them shared, during our Holy Hour together on their last evening, their lives would never be the same. 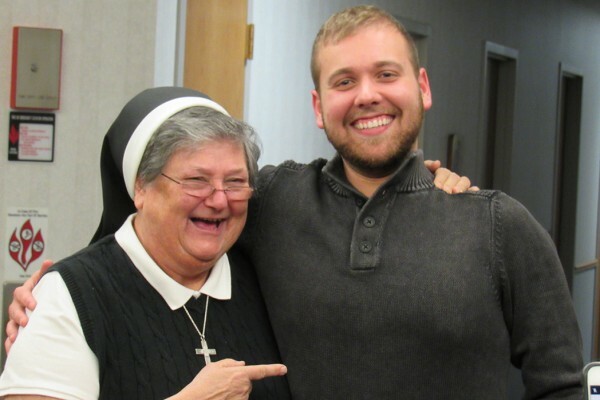 The service, sharing and being with the Sisters had an effect on who they were becoming. Thanks for being with us, students, you are a blessing to us here is Des Plaines! Sr. Theresita Donach shares this weekly reflection via e-mail with a group of women discerning their vocation. If you are interested in joining that online community, please e-mail tdonach@nazarethcsfn.org.